What is the Integrated System Model of Disability and Function (ISM, Lee & Lee): “it is a framework (not a classification system) to organize your tools.” Instead of abandoning the skills you already have it aims to organize your skills in a way that optimizes diagnosis and treatment. 3. It is centred around the patients values and goals. You must aim to find out what tasks and movements have meaning to the person in front of you? 4. The Gestalt of experience. It is our goal to bring awareness to body as a unit, not separate parts. Clients must experience their body in a different way for them to have success. 5. 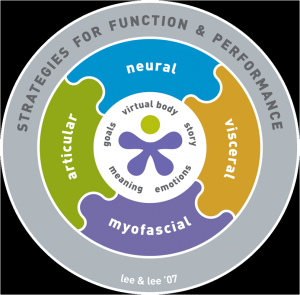 Body Self Neuro matrix (see post on pain or this picture): the integration of many things contribute to our pain, our dysfunction, and our challenges. 1. The model is based around giving people success. If we get them to move safely and without pain, their experience is both positive and powerful. 5. Recognizing that when treating one area of the body we can elicit changes to the entire system. We have the power to change thoughts, emotions, and experience with our hands and our words. Can we elicit a “whole body response?” Mark Finch, an incredible RMT out of Vancouver taking part in the series, coined this term…thanks Mark. I work at the clinic within the model already but I can’t wait for parts 2 and 3 and the collaboration between therapists that has already begun.